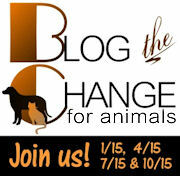 Cat Chat With Caren And Cody: Blog The Change: Making a difference for feral cats: a Guest Blog by Phil, "The Cat Guy"
Blog The Change: Making a difference for feral cats: a Guest Blog by Phil, "The Cat Guy"
FROM CAT CHAT: I am proud to be a supporter of the efforts of www.BtC4animals.com where bloggers come together to help animals in need and/or to showcase causes, stories about animals that are close to our heart and about PEOPLE who are making a difference. I am a "cat hobbyist", a "cat enthusiast", as many of you are. I am not the end-all be-all authority on MANY issues and never pass myself off as being one. When I want to feature animals, news or stories that I am not an expert in, I share blog posts with you by others who in many cases ARE authorities in specific areas that I am not, or have first-hand knowledge and experience about issues and stories that I may not have. Today, I am proud to present to you, one of these people! I am excited and honored to present to you today, "Phil, The Cat Guy"
For most of my life I somehow never noticed homeless cats. I'm not really sure how I managed this, maybe I just assumed outside cats must belong to someone or maybe I subconsciously just didn't want to see them. That’s all different now since a homeless black cat appeared in my yard and eventually entered my heart and opened my eyes to the world of trap, neuter and return of feral cats. In late 2010 I noticed a skinny black cat who kept coming around my yard. I didn't think much of it at first because free roaming cats come and go, but this one seemed hungry and skittish. I often saw him trying to find shelter from the constant rain and cold of the Seattle winter. Seeing his plight tugged on my heart and I started putting food out for him. Soon after that, I built him a covered place to eat and two fully insulated and heated homes in my yard (one for him and one for any guests he may have). He approved and immediately moved in. Over time he learned to trust me and eventually let me touch him. He's now known as Oliver. Right from the start I wanted to get Oliver neutered but I wasn't sure how to go about that. I spent hours online reading information on how to trap feral cats. I built a drop trap and purchased my first humane live cat trap. I somehow found the courage to trap him, brought him to my local vet and had him neutered. When he was recovered from his ordeal, I released him back into his yard. That all went fairly well for my first Trap, Neuter, Return (TNR) experience. Less than two weeks later I happened to glance out the window and saw three additional black cats in the yard! They were all friendly with Oliver and looked identical to him—Oliver had invited his family over to share in his good fortune. Suddenly I needed to figure out how to trap three cats at once and get them altered. It was exactly at this time that I read a blurb in the Purrfect Pals (my amazing local cat shelter) newsletter advertising a class on how to trap feral cats. The timing could not have been more perfect! 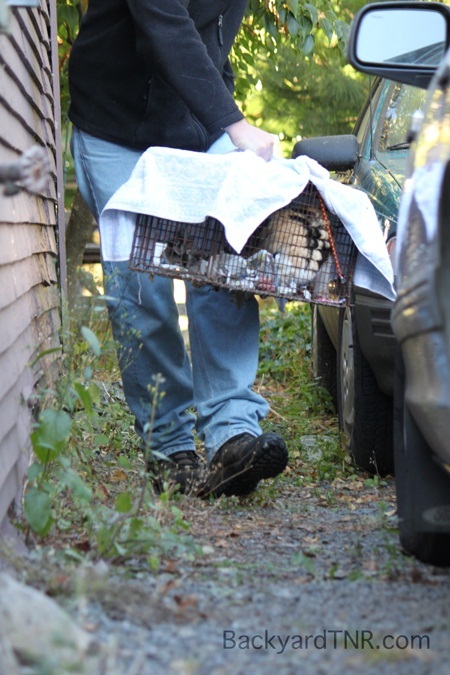 I jumped at the chance and learned a ton about how to trap feral cats for TNR. The class was taught by the Community Cat Coalition, which is a collaboration of independent TNR people and several local cat shelters and rescue groups who together train and mentor people in the ways of TNR. I met some amazingly helpful people who talked me through every step of successfully TNR'ing my backyard feral colony. Since learning the basics of TNR, I have had the opportunity to trap another feral in my backyard as well as to assist other people in the community in trapping feral cats. This past August I coordinated a TNR project that spanned a city block. In the end we trapped and altered 20 feral cats (6 males, 14 females and 14 of the 20 were kittens!) and we educated the neighborhood about the benefits of TNR. Thanks to Oliver I have learned that one person can make a significant difference in bettering the lives of homeless cats. And thanks to the Community Cat Coalition I have learned that a team of individuals and groups working together can make an even bigger difference. Oliver and his family continue to happily occupy my yard. Oliver has become quite friendly with me, but sadly he continues to urine mark and so remains a mostly outside cat. His family remains quite feral and they don't let me near, but I enjoy watching them and occasionally playing 'chase the red dot' (laser pointer) with them through the window. I like knowing they no longer need to worry about finding food or a safe place to sleep as they all have heated and secure places here. 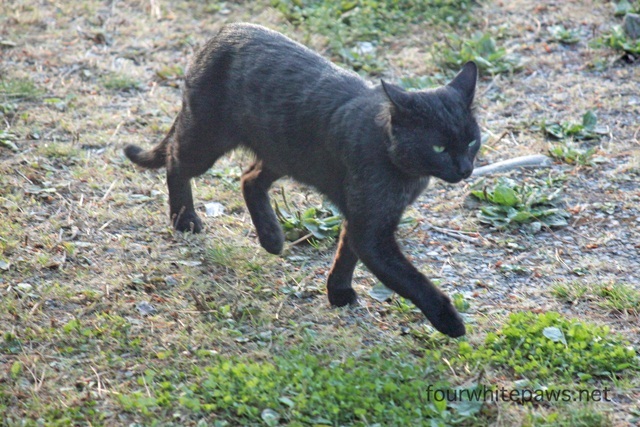 I recently started BackyardTNR.com, a site where I chronicle my TNR adventures, share helpful information about TNR and host a live streaming webcam of my backyard ferals. I also write about my indoor cats and all things cat on my fourwhitepaws.net blog. A great post, thank you Phil for being so kind to kitties that have nobody else. Aww, that's an awesome story, how cool! @Molly I had left a comment on your post that I tweeted it and put it on Facebook since I am in Michigan but I am nowhere near where the dog is missing but I shared it! What a brilliant post, it's always nice to be reminded of all the great people out there who are working hard to give animals a better life! We really enjoy reading about Phil and his work with the feral cats and things he build to make the ferals in his backyard comfortable and safe. Good job Mr. Phil! It's great there are people who take on the challenge of caring for ferals. Love the last photo especially....unconditional love is a beautiful thing! Caren, it was awesome of you to interview Phil. I follow his blog and I subscribed to his TNR one as well, quite some time ago, but gee, am not getting any posts! Must go check it out, as I'm sure I've missed a ton. Phil's efforts, and the efforts of those in his community, are to be commended. And Oliver...Well, amazing, isn't it, how one tiny Being can be such a vehicle for change for the Highest Good? Great article! We sort of celebrate Feral Cat Day every day. Since we live in the country, we feed a number of feral cats. The ones that mellow, we adopt as our own. Like our sweet Skeeter. @Fuzzy Tales THANK YOU! I am awfully impressed with both of his blogs and the incredible work that he is doing so selflessly and wanted to share him with others that might not be familiar with him. Thanks so much! @harringtonspetfood we couldn't agree more! I love that!!! That is just the kind of change that makes a difference every single day! That is a terrific post and so wonderful to hear about someone else that helps the feral cats. We sure will go visit your blog etc. Thanks so much for doing all that you are doing. Fantastic. What a great post! What a great guy! and Kudos to ypous - Caren and Cody for bringing it to our attention. Bless you Phil, for stepping up and taking care of Oliver and all the other ferals to whom you have shown such kindness and compassion. TNR is truly the way to go. Thank you too for spreading the word and motivating others to get involved too! Thanks Caren for allowing me to share Oliver's story with your readers. I am blessed to have several free spay/neuter clinics in my immediate area. One clinic alone (Feral Cat Spay Neuter Project) has a goal of 10,000 spay/neuters in 2012 alone and they are well on their way to meeting that goal! How awesome is that?!?! Slowly we are making a dent in the overpopulation of feral cats in the area. It's good to be helping them out. There are many little steps involved in TNR, if you're not helping out already maybe there is one small part of it you might be able to help with. Every little bit helps. And a big thanks to all those who are part of the TNR world!! I grew up on a farm and know all about surprise cat guests. Phil has a good heart and generous spirit. High five! Wow. I am always so stunned when I read about what individuals are doing to change the lives of animals in their communities. This is such important work and it's incredble so many private citizens are doing it on their own just because they care. Thank you for this inspiration. Five paws up for Phil and his efforts!! He is so right - all of us can make a difference and I loved reading his story. Blessings to Oliver and the whole outdoor gang! This is a great post. I never noticed homeless cats or knew about them before they were swarming everywhere in our new home 7 years ago. thanks for working for these great creatures! 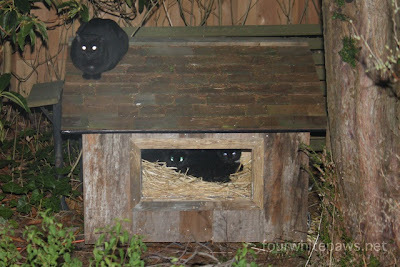 To anyone reading this - please visit my blog about a colony of abandoned/feral cats near my home. And you might decide to sign on as a follower to my blog since it has stories and information helpful for cat caretakers everywhere. What a heart warming story! Such a joy to read - thank you so much Phil! I just followed your blog and tweeted it! (@beyond_5) I also posted a story about the rescue I support on my blog. SO many caring peeps out there! Thanks, Caren! Great post. Long before we blogged Mom did the same for all of us - trapped and neutered about 25 cats in her neighborhood Back then all there was for info was Alley Cat Allies but they were super and helped mom lots. Soon everyone else was asking her info about feral cats.So glad there is so much more info out there now! Phil, I love that you chronicle the steps you took and how, at the start, every aspect of TNR was new to you. It was your little daily tasks that made the biggest difference. We can all make little daily contributions somehow, somewhere. Thank you so much for being such an inspiration. We loved this post. 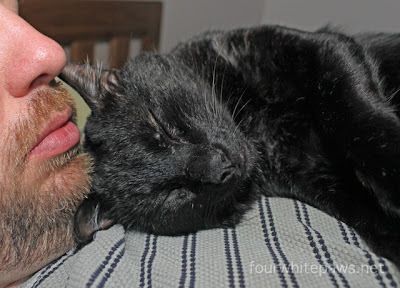 Thanks for hosting the guest post, Caren and Cody!And many thanks to Phil for being the cat guy that he is. We're such strong supporters of TNR. It works! The last photo is amazing!!!! @Rykers so glad you liked it...we sure did too! You are most welcome!! Yep I know you are HUGE supporters of TNR and it DOES work! @Art and Sew forth...you are most welcome! @Deb Barnes we loved reading it too! @Layla we sure do! Looking forward to your post tomorrow as well! @Phil WE are HONORED and WE THANK YOU!!!!! You are a gem! We love both of your blogs and wanted to help spread the word about all of the good that you do! @da tabbies we couldn't agree more and we thank PHIL! @Brian and everyone soooooo true! Wow, what a great guy to do so much for homeless animals. Phil is a true hero! I love that he shared his experience here today. The kitties surely appreciate it all I bet, know my feral cat is glad she was brought in. Thanks for this great post for Feral Cat Day, Caren and Cody. Great job, Phil! We appreciate all you and every other human helping ferals are doing. We have three or four ferals in our backyard. They still won't let me near, but they are comfy. Great post! We like the idea of Feral Day and hope it works - internationally! That last photo is so priceless! I'm going to check out his blog, looks super interesting! Thanks for sharing Phil's story! Our neighbors have built insulated cat houses in their yard for feral cats & have TNR/TSR the cats that were too unsocial to be adopted. We caught a litter 2 years ago that were able to be socialized and adopted out through Buddy Dog. Thanks again! What a great story from Phil. He is an inspiration and proof that one person can make a difference. How beautiful that those feral cats know there will be food and there will be shelter. And a big thank you to Phil. Phil, you are my hero! Those cats are so lucky having had your assistance and care. Life can be good for everyone if we allow for each other's differences and needs, and that applies to feral cats, too! Such a wonderful post!! We also have a place here in northern MN where I live that will spay/neuter feral cats for free. I have one that I am working on caputring but she is proving to be a challange. Currently all 3 of my indoor kitties are/were feral. Our oldest was about 5 when we took her in, she is now almost 20 years old, the othe two found us when they were mear kittens and are 2 and 3 years old. All 3 are proof there is no such thing as a free cat, but they are ohhh so worth every penny. Thank you Phil for being such a great champion of such a wonderful cause!! Great story. Kudos to you Phil for the wonderful help that you provide to those kitties.